As video games get bigger, longer, and more lifelike, they also get buggier. While excessive glitches can thoroughly ruin a gaming experience, others can surprise, delight, and occasionally frighten. Actually, bone-chilling terror is more often than not the common reaction, as is shown by this collection of recent glitches compiled by Looper. In it, you’ll see bizarre glitches from the likes of Overwatch, Donkey Kong Country: Tropical Freeze, and Grand Theft Auto V. It can be funny watching the familiar iconography from these games reassembled, but the best are the ones where the game’s pixels and algorithms became so confused that they created something heretofore unseen outside of nightmares. Try to create your own baseball player in MLB The Show 17, for example, and you could end up with a “skull-shaped bundle of dry spaghetti.” In Red Dead Redemption, it’s not enough that animals and humans merge into abominable amalgamations; no, they also pinwheel in the sky as if in the grips of demonic possession. 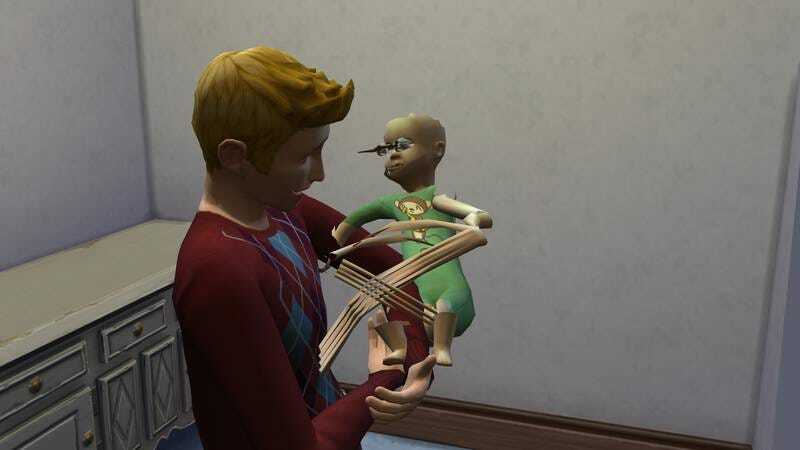 The baby in The Sims 4 looks like the unseen hell spawn at the end of Rosemary’s Baby, with eyes that protrude like antennae and an intense, gobbling lower jaw. It’s enough to make you want to disappear into a hole, which is great, because there’s a glitch in GTA V that does exactly that.